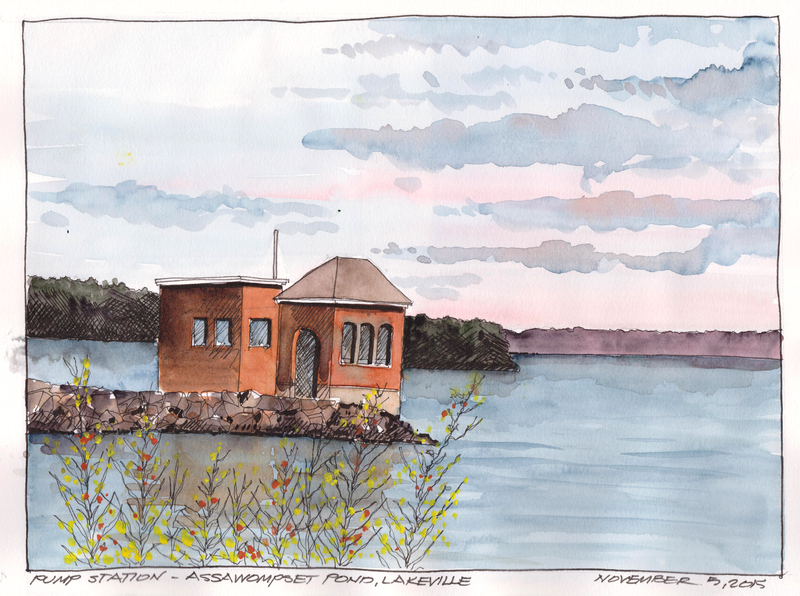 A watercolor sketch of one of the pump stations on Assawompset Pond in Lakeville, Massachusetts. There was still a little color on the horizon from the sunrise an hour earlier. I did not notice until I scanned this image that my structure on the left is leaning a little, oops. Assawompset Pond is a reservoir/pond within the towns of Lakeville and Middleboro in southeastern Massachusetts. At almost four square miles, it is the largest natural lake in Massachusetts. It is known in Wampanoag (local Indian tribe) as Place of the White Stones and is host for the largest Alewife (Herring) run in the eastern seaboard. In the early spring the Nemasket River runs black with fish heading for the spawning grounds. The origins of the King Philip’s War started with the discovery of John Sassamon’s body that was slipped under the ice on the pond and found the following spring. The outcome of the trial sparked the beginning of hostilities. Faber-Castell Pitt art pens with Holbein and Daniel Smith watercolors in a Stillman and Birn sketchbook. Nice watercolour, I like how you have the branches in the foreground… I really need to give watercolour a try.